Several options are offered for those who are interested in a modern yet time tested metal finish. 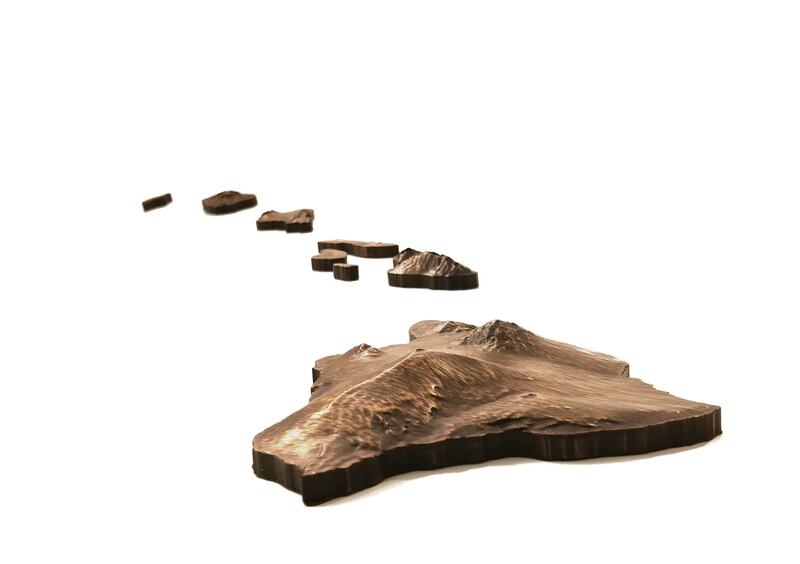 Such Hawaii Island Chains are created using modern materials which are manufactured in the USA and the end result is a bonded metal piece which boasts the benefits of a solid cast sculpture–without the weight, cost, or otherwise the burden of such an undertaking. The surface is approximately 90% metal on the face and edges of the island; the backs of the islands are black, and an entire 68″ size island chain weighs under 12 pounds. Metal finishes are in Copper, Bronze, Aluminum, & Iron–with additional available on request. As with most artwork handmade there will be some variances in color, texture, and shine. However, as one may notice there are numerous photos online of the island chains, and of course–the artist is more than willing to provide photos, and even material samples on request if desired. Such variances result from the hand mixing of the composite material, the source of the raw materials, the amount of polishing each island receives, and how the patina is applied/removed if such an option is selected. For those who want a darker set or with additional age or organic look black medal oxide patina is offered. 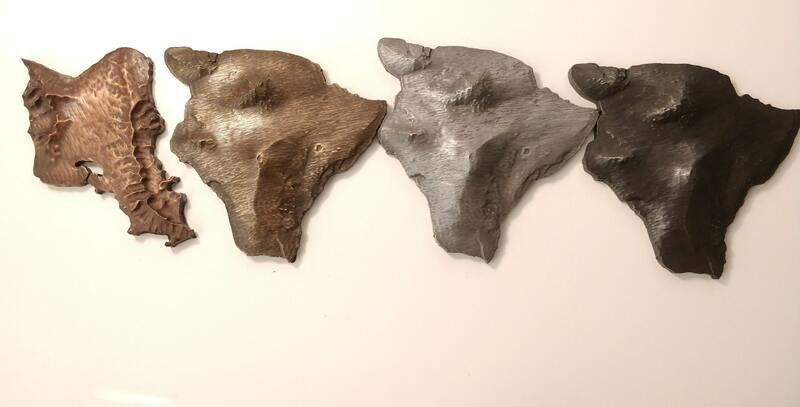 This is a hand finishing process where patina is applied and partially removed with a light abrasive, therefore, every set is unique, and to a degree be customized for one’s needs. The cost is an additional 10% or $15 (whichever is greatest) of any metal finish island chain and proof photos will be supplied before shipment. Below is a before and after slider on a bronze Big Island of Hawai’i with a medium/light patina along with one that is without patina. The final step is that the Hawaii Island Chain requires a coating to preserve the set and bring out the colors of the metal finish. Museum wax features a gentle glow with a light shine and has minimal surface build. The potential downside with wax is you have only one sheen and some want a smoother surface or other such adjustments of lacquer. Lacquer (not shown online) is offered in additional sheen options such as matte, satin, semi-gloss, and gloss. The potential downside is lacquer is a finish which adds build to the surface and some may find it adds a “plastic” feeling to the piece. Size is the most important consideration for an island chain. Firstly, there is some challenge in making an online purchase of wall art since size, and dimensions are at times difficult to visualize. Therefore, you will see ample mention of dimensions, how they measure, hanging templates for sizing are offered for sale, and hanging instructions are available online. If unsure of sizing after reading a listing please do not hesitate to email, call, or text the artist via the contact page. A response will be given within 1-2 business days. Your satisfaction is of utmost importance when considering a purchase.